Chipmonk hiding under our birdfeeder. Having stolen lots of sunflower seeds from the feeder just above his head, Little Chip was not about to leave such a treasure trove. He stayed under the feeder, in about 1" of space, while Tom took his picture, cheeks stuffed full. He was not going to move for anything. I had to paint him, he was so cute. The afternoon sun was setting so the shadows and lighting were perfect. This was painted from the great picture Tom was able to get. Acrylic on Pine, 7" x 12" x 7/8"
This piece is painted on a 7/8" thick board with gallery painting around the edges on all 4 sides. A great way to frame and mount this piece is to mount it on a silhouette frame that shows the painted edges. I like the effect you get as one walks down the hall or into a room. You may not be able to see the picture at all but you see a painted edge that gives you a glimpse that there is more to come as you move closer. 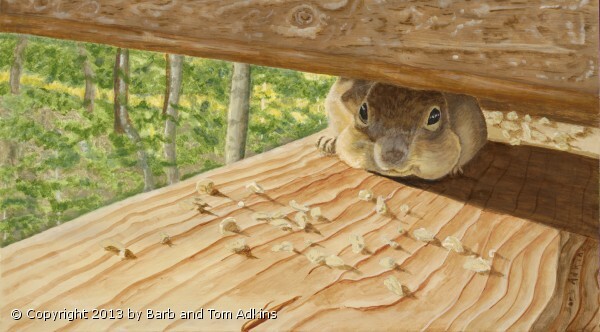 "Shhh...I'm Hiding" was accepted in the Juried Show, Pets to Predators, Center for the Arts in Evergreen, CO.
GiClee prints on Archival Hahnemuhle Torchon paper or Canvas available. Please call for sizes and pricing. Size: Walnut Gallery Edge, Silhouetter Frame 14' x 18"